Home / Retirement / 401k & Investing Tips / 5 Top Stock Trades for Thursday — Buy the Dip in GM or AT&T? While the indices continue to push higher, there’s a lot of activity below the surface. Given that we’re in the midst of earnings season, that revelation is perhaps not too surprising, but it does make for a number of good top stock trades to watch. On Wednesday before the open, General Motors (NYSE:GM) reported its second-quarter earnings results. While the automaker topped estimates, guidance for the rest of the year came up short. We tweeted out a chart on what levels investors should watch. So far — knock on wood — those levels are holding up after an early morning violation. $45 is obvious resistance and $39 was solid support. For long-term investors, buying or adding to their GM stake at $39 wasn’t a bad decision, even in hindsight. This is a low-valuation stock, with strong earnings, a bright future and a big dividend. That said, support didn’t hold up and given its guide for $6 in full-year earnings per share vs. expectations of $6.43, it’s hard to imagine Wall Street will grant it much of a pass going forward. That leaves these trend-line levels of support playing an important role. Should those fail, we’ll have to see how Wednesday’s low holds up. Life’s hard enough as a GM shareholder when the wind is at the automaker’s back, let alone blowing right in its face. AT&T (NYSE:T) was also hit on earnings. However, we have talked about this one extensively here on InvestorPlace — so readers were adequately prepared. Now paying out a 6.7% dividend yield and near vital, long-term support at $30, investors should be warming up to T stock. As its dividend yield continues to grow, remember that this dividend champ — which has paid and raised its dividend for 34 consecutive years — has only paid a yield of 6.9% or more twice in the last 30 years. Given that the yield didn’t shrink by being cut, it favors that the odds that a bottom is likely close by. Below $30 is more worrisome but still, that dividend is a huge cushion. While AT&T missed on revenue expectations, management boosted its earnings guidance, reported a big bump in cash flow and outlined a plan to reduce its leverage. The earnings reaction wasn’t good, but the situation doesn’t seem horrible at AT&T. Shares of Vicor (NASDAQ:VICR) were up more than 20% at one point Wednesday after the company reported earnings. Sales grew almost 30% year-over-year while earnings came in at 19 cents per share. That’s hard to say, since there are no analysts that actively cover the name. This $2.3 billion market cap stock that’s now up 180% so far in 2018 continues to fly under many investors’ nose. I have been following the company for a little while and marvel the growth it’s harnessed from the datacenter. But because of the cumbersome nature of its analysis and being late to the game myself, I have unfortunately avoided the stock as well. 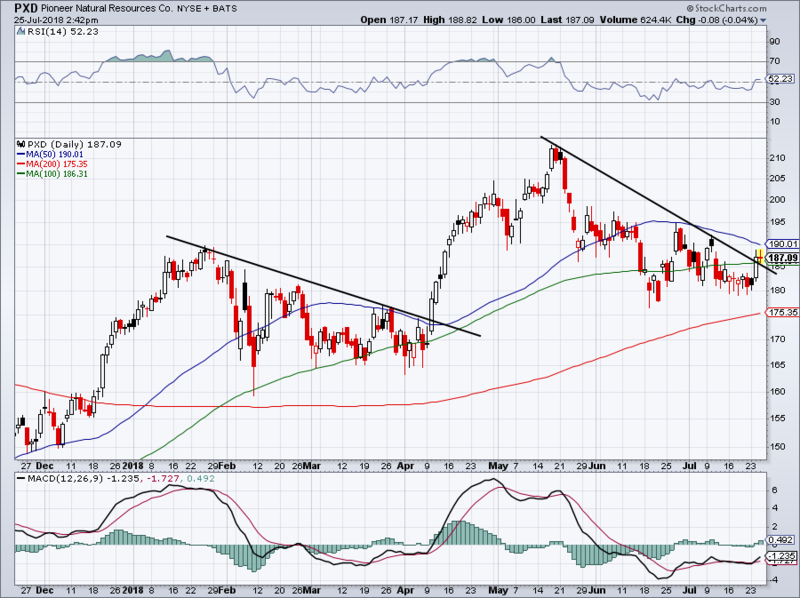 VICR has traded well off several trend-lines of support. However, that trade has become more difficult after shares blasted above $60 on Wednesday. 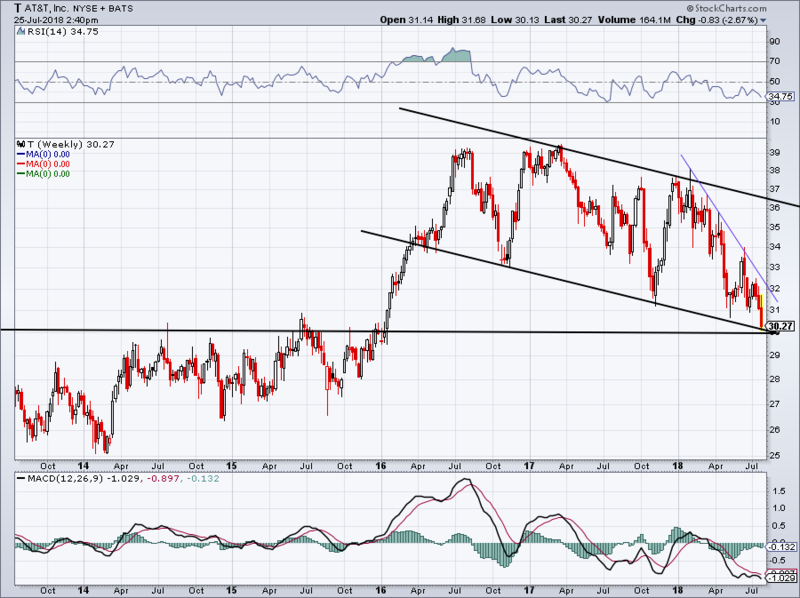 If shares pullback to $52.50, the recent breakout level, see if it can find support near this area. Below that and the 50-day moving average and trend-line support are the next stop. Over Wednesday’s highs will lead to more gains. Twitter (NYSE:TWTR) will report earnings on July 27th before the open. After exploding from $37 to $47 in just a few sessions, shares have been going through a very orderly correction and digestion. Given where it came from, it seems to favor the next move being higher, not lower for Twitter. Of course, it’s impossible to guarantee that, particularly ahead of an event like earnings. Investors can get an idea on TWTR after Facebook (NASDAQ:FB) reports earnings on Wednesday, but Twitter’s report will be the obvious catalyst. Until the stock breaks out of its current channel, there’s no point in guessing which way it will go. If it’s over, $50 is the target. 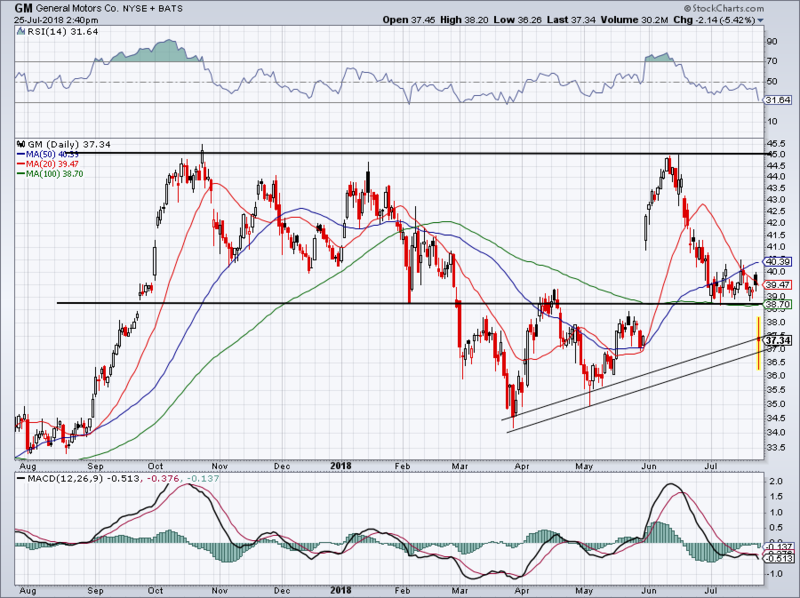 If Twitter breaks below, looks for prior breakout support near $37, along with the 100-day moving average, which has been support all throughout $2018. 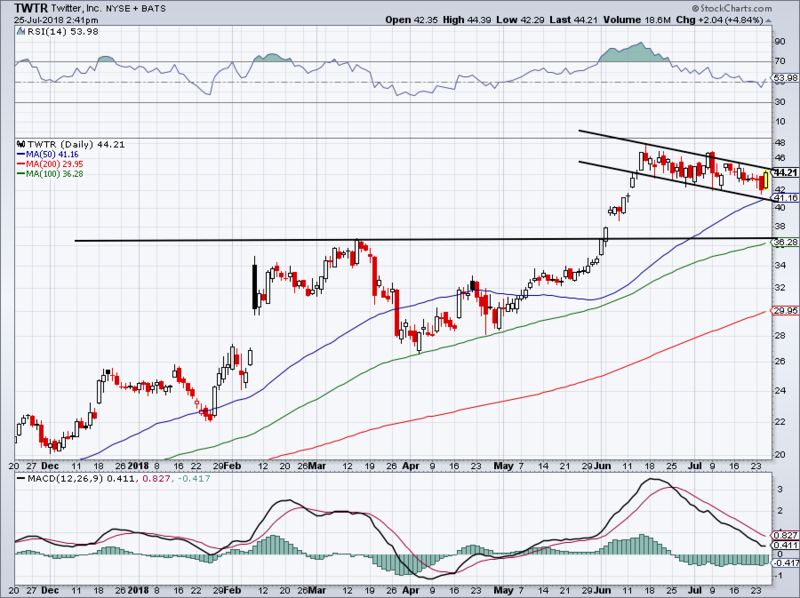 Be careful on a “false breakout,” which could occur if Facebook’s results push Twitter higher. 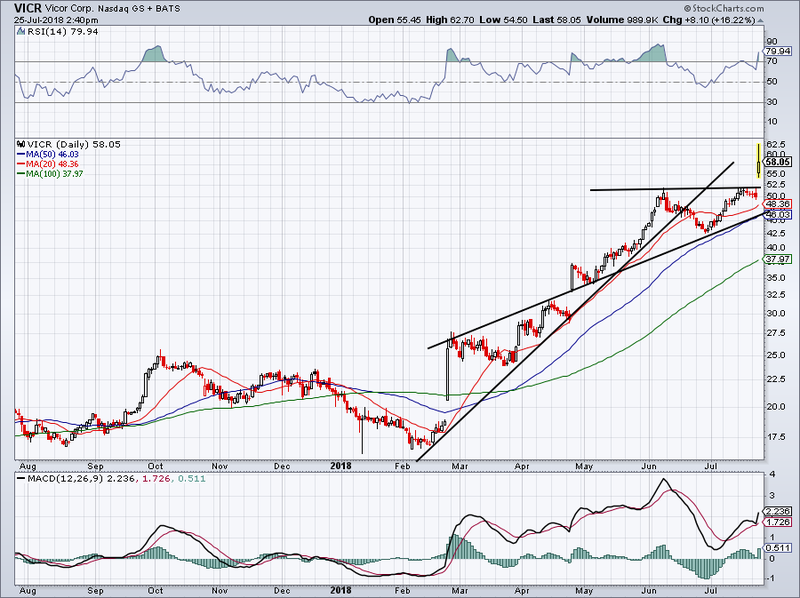 I definitely don’t hate the setup up in Pioneer Natural Resources (NYSE:PXD), although it’s not a name I trade often. Its April breakout led to big gains and bulls are hoping those results can repeat again. Over downtrend resistance and the 100-day, PXD’s next vital move will be clearing the 50-day moving average. If it can do so, there’s nothing to stop a run back into the $200s, technically speaking. Its MACD (bottom of the chart) is perking up too, which bodes well for bulls. PXD will report earnings on August 8th. Bret Kenwell is the manager and author of Future Blue Chips and is on Twitter @BretKenwell. As of this writing, Bret Kenwell held a long position in T.
Article printed from InvestorPlace Media, https://investorplace.com/2018/07/5-top-stock-trades-for-thursday-gm-t-pxd-twtr-vicr/.